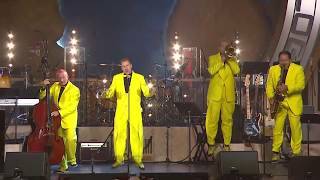 Renowned worldwide for their high-energy spectacular showmanship, their viral video ‘Bring Me Sunshine’ and for being the first live band to reach the final rounds of ‘Britain’s Got Talent’, The Jive Aces have firmly established themselves as the UK’s No.1 Jive & Swing band. Joining them will be Guest singer Miss Amy Baker. Videos and more at www.jiveaces.com. "Absolutely Brilliant! That really put me in a good mood"